Enjoy these snow dancing YouTube videos. This entry was posted in Things of Interest on December 31, 2014 by trakkers. Calling all Trakkers! This winter is off to a slow start. Let’s give Mother Nature a little nudge with these snow rituals from Destination Snow. This entry was posted in Snowshoeing, Things of Interest, Tips, XC Skiing on December 30, 2014 by trakkers. While this week’s snowfall was a promising start, the extended forecast is for mostly above 0 temperatures and not much precipitation – so Trakkers’ first Sunday Trip will be on Sunday, December 28. We’re tentatively scheduled to go to Wasaga Nordic, but we’ll be closely monitoring conditions all week so we can go where the snow is best. As Christmas day falls on Thursday (our pre-registration deadline), we’ve opened up registration early for the December 28 trip. Members can now log in their account to sign up themselves and their guests. Click here if you need a reminder on how to sign up. Contact Trish, our membership coordinator, if you need a reminder of your username to access your account. Follow us on Facebook or Twitter, or keep an eye on our web site, for further updates on destination resort. See the full Sunday Trips Policyfor more information. Are there any Trakkers members interested in volunteering to guide blind and vision impaired cross-country skiers on our Sunday Trips, or for skiing outside the club? The club has been contacted by a few individuals seeking volunteer guides. Training would be provided. The ability to quickly and precisely paint a “verbal picture” is a required asset. Shared trail fees and transportation costs could be arranged. Please contact davisbrowns@gmail.com for further information. Weekend Trips Spots Still Available! Applications are still being accepted for our Weekend Trips. While our Highlands Nordic and Blue Spruce trips are almost full, we still have quite a few rooms available for Pine Vista. For all trips, please try reserving, even if they are getting close to full. Sometimes a member may have to cancel, or if we have sufficient interest and it’s early enough, our Weekend Trips Coordinator may be able to book another cottage. The Farmhouse (always a Trakkers favourite) is up in the Collingwood area. It’s directly connected to the Highlands Nordic ski centre, so you can walk out the door to go skiing or snow-shoeing. We also get a reduced rate for trail fees, so don’t forget to mention this at the desk where passes are sold. The farmhouse has a total of 18 places, 7 single beds in the large common loft area. It also features a large kitchen, with a cool pantry to store some things. The extra large kitchen table serves as the common meeting area. Bedding is provided, but bring your own towel, etc. There is also a sauna inside. The nearby restaurant, Mylar & Loretas, can be booked for those who care to go there. Often we have a wine and cheese reception (impromptu, whoever wants to join in and contribute). Otherwise, you’re responsible for your own food. Work out with your ride the times for going on Friday. If there is sufficient demand, we can ask for some rooms/beds in their Woolner House, which is 1km down the road from the main farmhouse. There are two bedrooms with 3-4 beds per room. Quoted prices there are $30/person per night, or the whole bedroom for $100 per night. For Blue Spruce cottages, we have 3 cottages booked with a total of 15 places. Two ski areas, a short drive away, are Algonquin park (west gate) and Arrowhead. Neither is pre-booked, so you can take your pick, or just hang around the cottages, which also have an excellent ski trail system on the other side of Highway 60. There is also a cleared and flooded skating rink out on the lake, across the road. Often, due to the long drive, members like to take the entire Friday off, so check with your ride regarding this point. Check website for pics and cottage information. We’ve reserved 4 cottages for 18 spaces, held for the club till Dec 15th. Location is on Stoney Lake, on the south side. North side is Kawartha Prov. Park and a little further is Kawartha Nordic Cross-Country ski trails (about 20 minutes from resort). Pine Vista has some trails, snow-shoeing and skating on the lake. Each cottage has a wood fireplace and whirlpool bathtub. The resot also has both an outdoor and indoor hot-tub and games room. Also check your ride for taking the Friday off. Check website for pics and cottage information. This entry was posted in President's Blogs on December 14, 2014 by trakkers. A handful of resorts are starting to open for early season “rock skiing”. The club’s first Sunday trip is tentatively scheduled for Sunday, December 21 at Kawartha Nordic, but this will depend entirely on the conditions and member sign-ups. Everyone keep your fingers crossed for more snow and consistently cold temperatures. Follow Trakkers on Facebook or Twitter (or keep checking our web site) to get the latest updates on our first Sunday Trip date and destination. We had a fantastic turnout of new and familiar faces for this year’s Open House and it was wonderful to see everyone there. 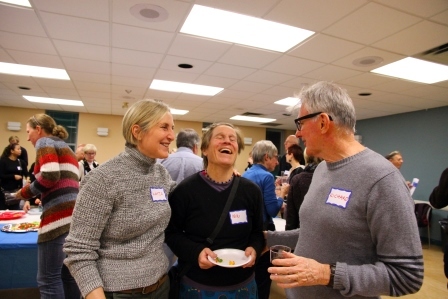 Thanks go out to all our fantastic volunteers who helped make the evening run so smoothly, and a special shout-out to all our door prize donors: Sail, Hardwood Ski and Bike, Scenic Caves, Mansfield, Horseshoe, Highlands Nordic, and Axis Gear! The Open House also got profiled by snapd Bloor West newspaper. Check out our Facebook page for more photos. Only a Few Spots Left for Weekend Trips! Applications are still being accepted for our Weekend Trips. For all trips, please try reserving, even if they are getting close to full. Sometimes a member may have to cancel, or if we have sufficient interest and it’s early enough, our Weekend Trips Coordinator may be able to book another cottage. This entry was posted in President's Blogs on December 2, 2014 by trakkers.